Setting up bundles in Inventory Planner ensures that sales demand of the bundle are accounted for in the components of that bundle. 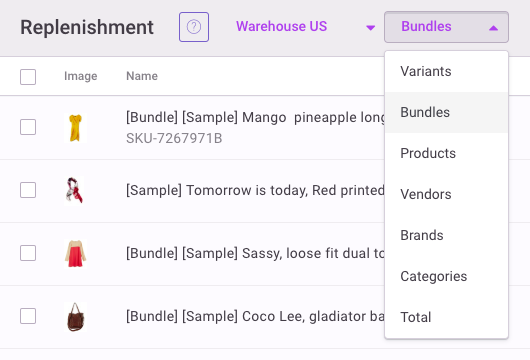 Bundles need to be configured so that you are ordering enough to meet demand of both individual sales and sales of bundles where the item is a component. If you use an inventory management system that supports bundles/kitting natively you don't have to configure anything in Inventory Planner. 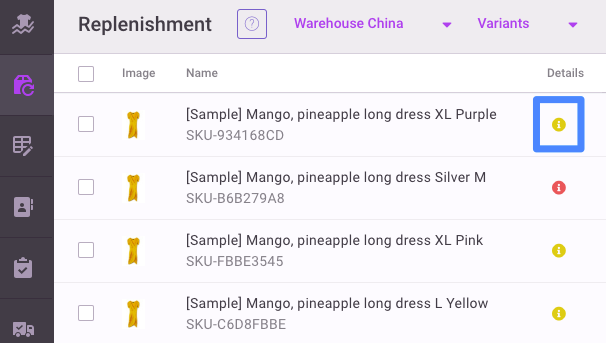 We will automatically detect bundles and re-assign all sales to their variants. You will only see sellable items in the replenishment report and the forecast will be based on the combined sales (all bundles + product sales). Use an application from their marketplace to create bundles and manage stock for them. Inventory Planner does manage stock so you need to ensure that bundle sales reduce components correctly. Mark bundled products within your Inventory Planner account. This allows Inventory Planner to maintain accurate sales (customer demand) for components when a bundle is sold. To mark a product as bundle in Inventory Planner go to Replenishment > Variants. Find the bundle SKU, click on Details. Then view the Bundles tab within Details. Here you will mark the SKU as a "bundle". Next add all components with corresponding quantities. If you need to create a variant as a component that is not a variant on your platform (listed for sale individually), then you can create an IP Variant. Instructions for adding an IP Variant are at the end of this article. If your bundles are assembled prior to fulfillment (that is, stock of your bundles is separate from stock for each of its components) then check the box to 'Account for bundle stock in components'. If your bundles are assembled at the time of fulfillment, then do not check the box for 'Account for bundle stock in components'. For example, say you have Product A which you sell individually and in the pack of 6. If you have 60 units of A and this means you also have 10 units of Ax6, then do not enable 'Account for bundle stock in components. If you have 60 units of A and another 30 units of Ax6 (different assembled stock) so 60 + 30*6 units of A in total, then this option should be enabled. > Forecast > Account for stock in bundles. Once a bundle is configured you will be asked to recompute sales for your store. After the recompute, bundles will show in Replenishment > Bundles. Bundle components will appear in the Variants view and the forecast for those components will include both demand for the bundle and the product sold individually outside of the bundle. To unbundle an item, find a bundle first in the replenishment report by using the Bundle view. Then click Details > Bundles and uncheck the bundle option. If there is a component of your bundle that is not sold individually, you can create an IP variant by clicking on Add New Variant. An IP Variant only exists in Inventory Planner. Note that this is not for creating a new product that will be added to your platform to be sold on its own. A new product for sale should be created on your platform then synced to Inventory Planner. Create a title, SKU, and assign a vendor for this new variant. You can optionally enter the cost price, retail price (useful for calculating retail stock value metrics) and a barcode. You can also set the starting stock level in each warehouse for the component, along with lead time and days of stock for each location. Click Create Variant. To control stock of IP variants, there are two options. One is to tie stock of the component to sales of the bundle. 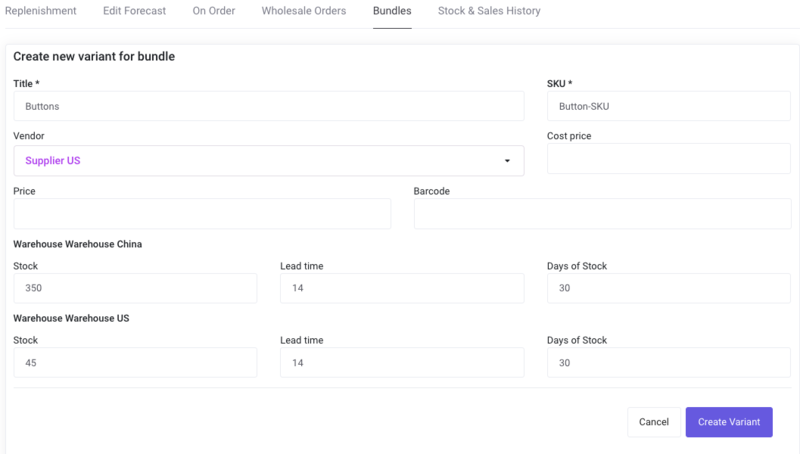 When you click the checkbox to 'Manage components stock based on bundles sales', each sale of the bundle will reduce stock of the component by the corresponding amount. For example, if three units of an IP variant go into each bundle, a bundle sale will reduce stock of the variant by three units. The second option to deplete stock of an IP variant is to include it on a warehouse transfer. For example, if you purchase Product Z in individual units from your supplier and sell it on Amazon in packs of two, you may need to bundle the individual units. In this case, you will create a warehouse transfer to the Amazon warehouse with the bundles by creating an assembly.